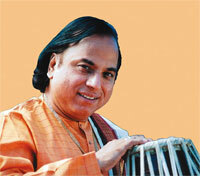 Taalyogi Pandit Suresh Talwalkar, is one of the greatest Tabla exponents of the present times. As an accomplished artist and as a Guru, he has contributed immensely to the glorious tradition of Indian Classical Music. Pandit Sureshji belongs to the illustrious “Keertankar” family of Shri Dholebuva. “solo performer” with unique expression. Being privileged with am unparalleled talent, since the early days, Sureshji has accompanied a number of great artists in their concerts. Pt. Gajananbuva Joshi and Pt. Nivruttibuva Sarnaik are amongst those whom he accompanied the most. He gratefully regards them as gurus and attributes to them the deep insight that, he carries today for the classical music. Sureshji introduced for the first time, the novel concept of taking vocal accompaniment and added a new dimension and direction to the solo playing of tabla. His genius is highlighted by the exquisite renderings of “Taal Mala” and “Joad Taal”, a contribution applauded alike by connoisseurs and masses. “Taal Yatra” can be cited best for the same. His compositions have influenced not only the musicians from India but also from the Western countries and today, many jazz composers seek his guidance in their musical journey. Sureshji believes that, “Guru Shishya Parampara” is the soul of Indian classical music and he is an ardent follower of the same. As a guru, his teaching abilities and expertise is unmatched. Today, amongst the best tabla players in the newer generation, majority are his disciples. Under his guidance, they have attained a proficiency, equally high, whether in the solo playing or, in the accompaniment for vocal, instrumental music and Kathak dance. Vijay Ghate, Ramdas Palsule, Charudatta Phadke, his prodigious son Satyajit and many more, are always quoted in this context. He groomed some of them, like Shantilal Shaha and Rajprasad Dharmadhikari, for the teaching abilities. His rigorous training for “Laya Taal” and its aesthetic to the famous Kathak exponent Shama Bhate, is reflected even in her students. Today, Vidya Deshpande, Sheela Mehta, and Shambhavi Vaze are other Kathak dancers who continue to be under his training for the same. What is more, Suresji`s knowledge and command in rhythm has enabled him to guide the well known percussionists like Trilok Gurtu, Mukul Dongare, Taalis and others. Whether on tabla or, on musicology. The renowned institutions and universities from world over take pride in inviting him as a speaker. He is also a chief Guru for a project based on Guru Shishya Parampara, initiated by a centurion organization in Kolhapur, India. Sureshji is conferred upon with a number of awards and honors. The most prestigious of them include, Pt. 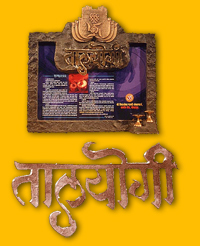 Vishnu Digambar Paluskar Award, Vasantrao Naik Puraskar, an award from Naad Brahma as well as from Govt. of Andhra Pradesh and, the title of “Taal Yogi” rendered by the Shankaracharya. Sureshji is also honoured at the hands of the President of India Dr. A.P.J. Abdul Kalam, with the prestigious “Sangeet Natak Academy Award”, a national award for his contribution to the classical music. He is amongst the top tabla players of India, who travels regularly for his programmes across and outside of his country. He frequently visits Asian and European countries which include Singapore, Thailand, Austria, Schwitzerland, Germany, UK, USA and Canada. He has also toured to Middle-East, Turkey, Norway, Spain, Iran, Sweden, France, Holland and to the African Continent. Pandit Suresh Talwalkar is indeed a name, synonym for the untiring efforts, devotion, and endless passion in pursuit of promoting Indian classical music.